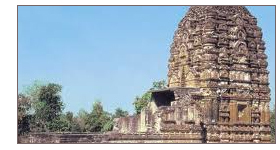 The small village of Sirpur in present day Chhattisgarh was an important center of Buddhist learning from 6th to 10th centuries. Known as Shripur in ancient times, the site was dotted with 100 ancient Hindu Temples and 100 Buddhist Viharas or monasteries. After recent excavations, the village unearthed a treasure trove of riches including beautiful and intricate statues, pillars, pottery, coins, viharas and a complete market place. The ruins of predominant Buddhist monasteries at Sirpur include Anand Prabhu Kudi Vihar and Swastik Vihar. The major highlight of Anand Prabhu Kudi Vihar is the six feet tall statue of Buddha touching the earth installed inside the complex. The recently excavated Swastik Vihar was the meditation and study complex used by Buddhists. According to the accounts of Chinese traveller and Buddhist monk, Hiuen Tsang, thousands of students came to Sirpur to study Buddhism.